On Friday we told you about Lucy Attrill, a 14 year old pupil of Kings Norton Girl’s School. 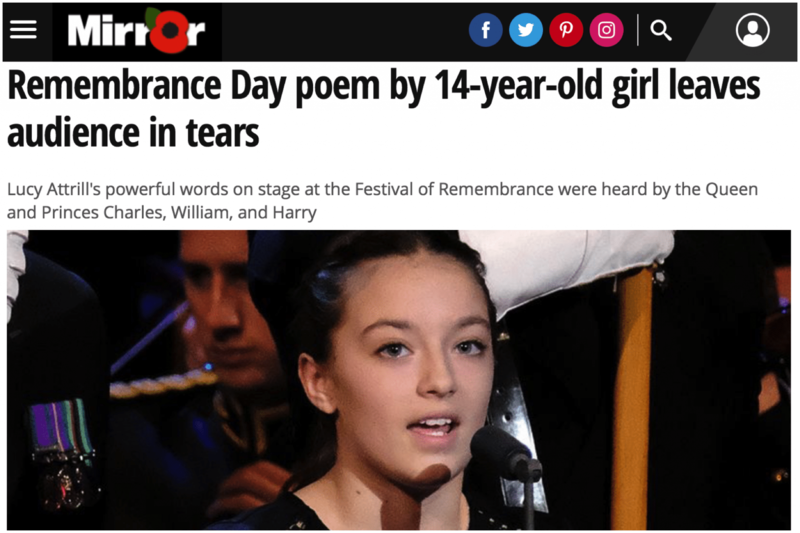 After winning first prize in her category of the Royal British Legion poetry competition, Lucy was invited to recite her poem ‘Thank You’ at the Festival of Remembrance yesterday (Saturday 10th November). While Lucy’s recital sadly didn’t make it on to our TV screens, her moving performance in front of Her Majesty The Queen and other members of the royal family at the Royal Albert Hall has received coverage in the national media. The Mirror online wrote: “A century on from the end of a war renowned for its soldier poets, it was lines from a 14-year-old schoolgirl that moistened eyes at a Festival of Remembrance on Saturday. When you should have been in class. That’s a debt we can’t repay. But your luck was not so kind. But our world might not be the same. You all deserve the best.